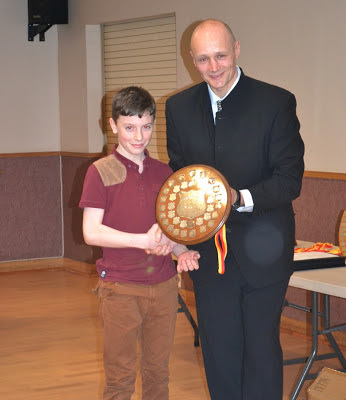 The biggest cheers of the night at the Annual Dinner and Prize Presentation were reserved for Jack O’Boyle who was the winner of the Junior Best All Rounder Shield and Graham Price who took the covetted Sturgess Trophy. Martin Price, the new Recorder’s presentation was quite slick, and he was aided by Tom McGhie, Steve Burton and Sophie McGhie who was in charge of the photography. Apart from the serious business of making the awards, there was the usual hillarious interlude culminating in the award of the Golden Spanner to Michael Vennard for most mechanical mishaps. There were 8 Club Standard Gold Medallists, 3 Silver Medallists and 3 Bronze Medallists, achieved over 3 events with 20 receiving Gold, Silver or Bronze Certificates for One event. Awarded for improvements at 10, 25 & 50 mile TT. 2014 club dinner and presentation evening is Saturday 22nd Feb. At sandal rugby club again. Email invitations will be out soon. £15 per person.